The newly passed law, made in response to the country's Imperial Household Law's lack of abdication provisions, applies to only Akihito, aged 83. It prohibits Akihito's successors from abdicating. Akihito ascended to the 2,000-year-old Chrysanthemum Throne when his father Emperor Hirohito died in 1989. 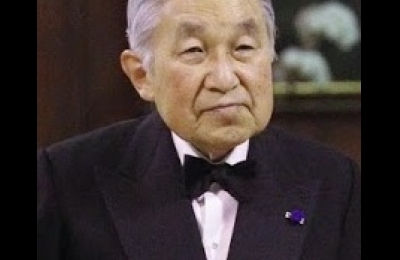 Having a cardiac surgery and treatment for prostate cancer, Akihito in a televised address last year said age and health were interfering with his duties. Per Japan's current constitution, an emperor cannot make political statements, so Akihito did not explicitly mention abdication. When abdication happens, under new law, Akihito's son and heir apparent Naruhito will ascend the throne, becoming the country's 126th emperor. Besides Naruhito, Akihito has another son and a daughter. Emperor Akihito's heir apparent Naruhito, born in 1960, graduated from Oxford University and married a Harvard University graduate Masako Owada in 1993. Portland State University professor Kenneth Ruoff told the BBC that, while Akihito and his wife have been active in social causes, Naruhito and Masako have done little in this regard. A Kyoto Sangyo University emeritus professor Isao Tokoro said Naruhito "has been educated," is born, and is qualified "to be emperor[.]" In 2006, the National Diet debated on allowing female ascendance, as the emperor lacked grandsons at the time, due to the current male-only royal ascendance laws. Then Hisahito, now 10, was born, and the debate lapsed. Naruhito has only one child Aiki, 15, while his brother Prince Akishino, 51, has three children, including his only son Hisahito. Per current law, Hisahito is qualified to ascend after his uncle Naruhito and his father. The royal family currently has 19 living members, including seven unmarried princesses and five males. Female royals, if marrying a commoner, would have to give up their royal status, leaving the royal family, while males would still be allowed to retain their royal status after marrying a commoner. Akishino's daughter Princess Mako announced her plans last month to relinquish her royal status and leave the royal family in order marry a commoner Kei Komuro, a graduate student and law firm worker, both of them aged 25. In 2005, Mako's aunt and Naruhito's sister Sayako, formerly Princess Nori, married a commoner Yoshiki Kuroda, a town planner, and was forced to relinquish her status and leave the family. A Temple University Japan professor Jeff Kingston said a national succession crisis has people raising concerns about female princesses leaving the royal family when getting married. Kingston added the family "[has] a shortage of male heirs." Kingston also said ousting a female royal for marrying a commoner is "a very old-fashioned approach, totally out of sync with 21st-century norms" to many people around the world, including in Japan. In a survey by Kyodo News conducted in May of about 3000 people at least 18 years old, 68 percent said the Imperial Household Law should be amended to allow future emperors to abdicate. 25 percent favored separately legislating each abdication. Four percent said abdication of emperors should never be allowed. On questions involving female royals, 86 percent said to allow empresses, 59 percent supported both empresses and established branches of female lineages. 62 percent supported establishment of separate branches for princesses retaining their roles while marrying commoners; 35 percent opposed. 61 percent said female ascendance should be debated only after the abdication, while 28 percent said it shouldn't wait for the abdication. Early this year, the Japanese Prime Minister Shinzo Abe considered giving imperial status to branches of those who left the royal family. In the survey, 22 percent supported the idea; 72 percent opposed. The Abe government has avoided the debate of female ascendance but recently passed a non-binding resolution attached to the newly passed abdication law to consider how to strengthen female royal status, possibly including allowing them to retain their royal titles and continue their duties, to compensate for the declining royal population.